Deborah K. Takahash is branch librarian for Pasadena Public Library. She specializes in Youth Services. Certified in Youth Mental Health First Aid, she writes for ALA's Young Adult Library Services Association (YALSA) blog. Takahashi, Deborah. 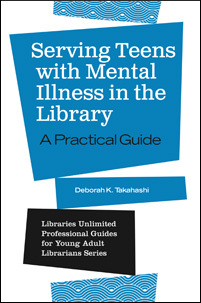 Serving Teens with Mental Illness in the Library: A Practical Guide. Libraries Unlimited, 2019. ABC-CLIO, publisher.abc-clio.com/9781440862779. As a teen librarian, you are more likely than not to encounter teens with mental health issues. Will you know how to help them? This guide explains what to do and what not to do.